What Does the Medicare “Doc Fix” Bill Do? Replaces the Sustainable Growth Rate (SGR) formula that cuts Medicare doctors pay in theory, but has been pushed off by 17 short-term patches since 2002 to avoid doctors refusing to take Medicare patients. Medicare doctors would have seen a 21% cut in April of 2015 if the fix wasn’t passed. Makes the qualifying individual (QI) program that subsidizes Medicare Part B premiums for beneficiaries who earn 120% to 135% of federal poverty levelpermanent. Extends the Medicare Advantage special needs plans (SNPs) through the end of 2018. Extends the Children’s Health Insurance Program (CHIP) for two years (for a total of 4 more years, it was already extended for 2). Removes social security numbers from newly issued Medicare cards by April 16, 2019 with new cards issued no more than four years later. Decreasing funding to supplemental Medicare plans specifically reducing spending on “first dollar” coverage of supplemental Medigap plans enjoyed by some from 2020 onward (if you have a Medigap plan that does this you can keep it, but new ones wont be sold). Requiring higher premiums for seniors who make more than $133,500 to pay more for Medicare coverage starting in 2018. Implementing new quality measures that follow that ACA’s lead of rewarding quality care over quantity. How Does the “Doc Fix” Work? MACRA will freeze Medicare rates at pre-April levels through June, and then raise them0.5% in the second half of the year. They will continue to increase 0.5% each year from 2016 through 2019. At the same time, MACRA will shift Medicare compensation from fee-for-service to pay-for-performance. This is part of an ongoing effort to cut back on Medicare spending and improve Medicare by focusing on quality over quantity. What Was Wrong with the Sustainable Growth Rate Formula and How Does the Medicare Access and CHIP Reauthorization Act of 2015 Affect it? The Sustainable Growth Rate Formula was enacted by the Balanced Budget Act of 1997 to amend Section 1848(f) of the Social Security Act. It replaced the Medicare Volume Performance Standard (MVPS), which was the previous method that the Center of Medicare and Medicaid services (CMS) used in an attempt to control Medicare spending. The SGR cut doctor pay every year up to 20% according to the formula (a set of rules based on changes in fees and GDP). The goal behind the SGR was to cut Medicare spending, but in practice congress has passed 17 short-term patches since 2003 to stave off the cuts. This is because when doctors pay goes down more doctors refuse to take Medicare patients. Past adjustments to the formula were made in 2006-2013, although none were contained within the Affordable Care Act. Medicare doctors would have seen a 21% cut on April 15 of 2015 if the fix wasn’t passed (the 21% cut happened on the 1st of April, but there is a 14 day lag before paying electronic claims. So that would have happened on the 15th. The Act was signed just in-time for CMS to reverse the cuts and pay the new rates). By 2048, the gap between payments and practice expenses are projected to be greater than if Congress had let the SGR formula take effect (which they hadn’t actually been doing), according to a March CMS report. Does MACRA Increase Medicare Costs? Just like it was before the new law, higher income Seniors pay higher premiums for Part B and Part D. For most other Medicare recipients, the government pays about 75% of the premium and the beneficiary pays 25%. The amount seniors pay is based on modified adjusted gross income (MAGI). Starting in January 2018, new income limits take effect that will subject some Medicare beneficiaries to higher income-related premium adjustments. Below are the percentage of premiums that seniors will pay under the changes. *Limits for married couples are twice the limits listed here. Starting in 2020, all income thresholds will be updated (indexed) annually for inflation. Why Increase Premiums For High Income Seniors? The money has to come from somewhere and while funding is provided by federal borrowing and quality control in Medicare pays for part of it, the rest is paid by high income seniors who can (arguably) afford to pay more for Medicare. Both the ACA and the new “doc fix” law increased part B premiums for high income seniors. While the ACA closes the donut hole to help all seniors, Part D premiums can be higher for high income seniors under the new rules too. By increasing high income seniors premiums MACRA offsets $73 billion of the measure’s $214 billion cost by making wealthier seniors pay more for their care and reducing payments for hospitals and nursing homes. Supplemental Medigap plans (sold by private for-profit insurance companies) arguably exploit the fact that Medicare pays “the first dollar”. That means Medicare ends up footing the bill for coverage that Seniors pay a premium to private companies for. By cutting back on Medigap funding Medicare saves money and requires private companies to take on more of the burden in exchange for the profit of selling Medigap plans. Without CHIP tens of millions of children would lose access to health coverage. Perhaps even more than Medicare the extension of CHIP has just about the strongest support of any bi-partisan Government program. It’s arguable that even the most extreme idealist small government Libertarian would cut CHIP. CHIP requires congress to extend it. How Much Does the New Medicare Act Cost? The Medicare Access and CHIP Reauthorization Act of 2015 costs $214 billion and is projected to add $141 billion to the deficit. Who Voted For the Bill? The house passed the bill 392-37 and Congress passed the bill. The Senate vote was 92-8. 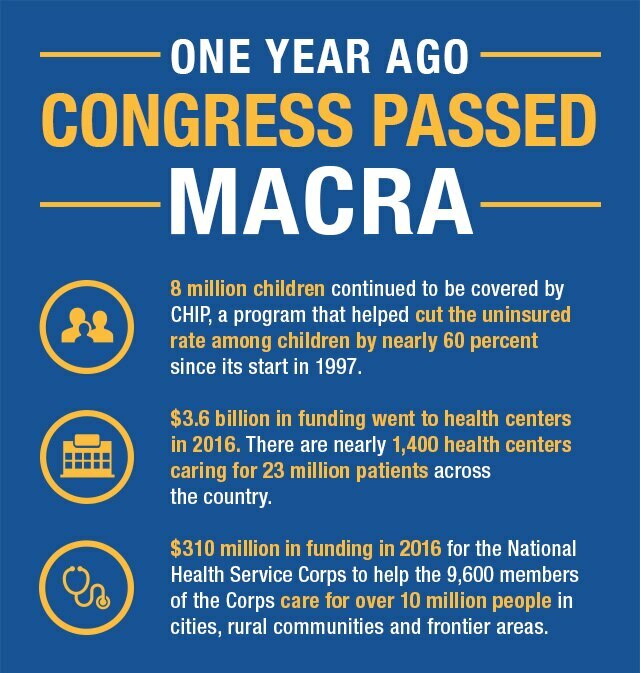 The law had overwhelming support due to the cutting of spending, extension of CHIP, and the fix to the doctor formula that has plagued congress for the past 15 years.